The budget document contains the FY2018/FY2019 biennium budget for Greenville County and describes how the County government plans to meet the community’s needs. The document is not only an assembly of information required for making policy and resource decisions; it is also a resource for citizens in learning more about the operation of their county government. The County of Greenville’s budget document is divided into the following major sections: Budget Message, Introduction, Budget Summaries, Fund Overview, and Appendix. These sections contain information useful to the administration of the County and are cross-referenced throughout the program document. Financial data, for example, is presented in two sections: (1) the budget summaries section presents actual revenues and expenditures, as well as projected future year revenues and expenditures; and (2) the fund overviews present the budgets by department to demonstrate the connection between resources, programs, and services. This section contains the County Administrator’s budget message which outlines key features of the FY2018/FY2019 biennium budget and a discussion of past and future challenges in budgeting. The message also discusses underlying administrative practices that support the County’s budget goals. The Introduction section provides an overview of the organizational and fund structure, an overview of the budget process and fund types, a discussion of the budgetary and financial management systems utilized by the County, and the County’s financial policies. The Budget Summaries section contains a comprehensive analysis of revenues and appropriations for all funds. This section summarizes the overall financial condition of the County’s major funds. The Fund Sections include an overview of departmental budgets. Information about each department, including a description, budget, and performance measures, is also presented. To provide a comparison, data is provided for FY2016 through FY2019. The Capital Projects section includes information on the County’s Capital Improvement Program and provides a summary of expenditures. There is an overview of the County’s five-year capital plan, along with a description of each capital project approved for the biennium budget period. This section provides a discussion on the subject of debt financing that has been used for various capital projects. The Appendix Section contains statistical information about Greenville County and a glossary for the budget document. This section also includes the approved budget ordinances for both years of the biennium. About the Cover: The cover was designed by Anna Rodrigue, an employee of the Greenville County Information Systems Division in web design/development. The image is the nineteenth-century iron gazebo that adorns the beautiful Rose Garden located at Furman University in Greenville County. 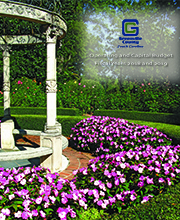 The rose garden boasts 21 varieties of roses and more than 800 bushes along with the gazebo. For complete document, click here.